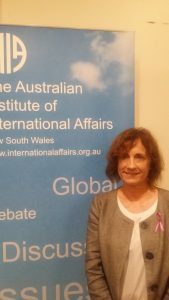 In a compelling address at Glover Cottages on Tuesday 6 March, Lesley Hughes, Professor of Biology and Pro Vice-Chancellor (Research Integrity & Development) at Macquarie University, discussed the science, impacts and future of climate change. Professor Hughes began with a comprehensive analysis and discussion of anthropogenic (human-induced) climate change trends. She explained that we are now experiencing unprecedented levels of carbon dioxide in the atmosphere which sit well outside the normal Natural Variable Zone. Globally, these record high levels of greenhouse gases, combined with rising sea levels and increased average temperatures, are impacting on all aspects of human life. Increases in global average temperatures are exacerbating the quantity and extent of natural disasters such as floods, cyclones, bushfires and heat waves. This decade, Professor Hughes explained, we have seen a three-fold increase in the number of extreme hot days compared the 1960s, and have witnessed a significant rise in the number of natural disasters reported globally since 2000. In addition to increased average temperatures, sea levels have risen to three times their 1960 levels. Our oceans are absorbing 90 per cent of the excess heat in the atmosphere and 40 per cent of the CO2, and are consequently becoming warmer. The negative feedback loop of warmer temperatures and increased sea levels is subject to a time lag of approximately 20 years, meaning that sea levels are likely to increase by up to 20m in the near future. In an attempt to highlight the progress that has been made in addressing climate change, Professor Hughes praised the Paris Climate Agreement as being the first step toward an international consensus on climate action, but argued that much more is needed in order to achieve the structural changes necessary to keep global temperatures below 2 degrees Celsius above the pre-industrial era. She criticized the Australian Government’s lack of progress in meeting our international commitments, and pointed out that Australia has the highest emissions per capita of all OECD countries and is currently on track to increase emissions by 27% by 2030. In question time, Hughes gave a strong reminder to sceptics in her audience that, although the statistics on climate change seem pessimistic, the only way to achieve effective action is through realising the potential and power each individual has in instigating change. She argued that climate change is not a problem for future generations, but is an issue that needs to be addressed today by all people at all social, economic and political levels around the world.